Ger district on the outskirts of Ulaanbaatar, the capital of Mongolia. Photograph: Anna Rühl. With over 250 days of sunshine a year, Mongolians call their country the Land of the Blue Sky. Except sometimes it’s not. On a winter’s day in the capital city of Ulaanbaatar—home to approximately half of the country’s population of three million—air pollution can be so bad that the weather forecast reads “smoke,” and it feels and smells as if you could cure meat just by leaving it outdoors. While some of this air pollution is caused by the coal-fired power plants that provide energy for the city’s industry, shops, and apartments, another major contributor becomes obvious when leaving the city center of shiny high-rises and busy shopping streets: Ulaanbaatar’s ger districts. The ger, or yurt, is the nomadic herders’ traditional dwelling. Over the past ten to 20 years, many herders have given up their traditional way of life to pitch their mobile homes permanently on the outskirts of the city. An estimated 800,000 people now live in these settlements, without regular access to drinking water, a sewage system, or transport infrastructure. They move because they have lost their livestock in harsh winters with droughts and ice-covered pastures—the zud (a severe winter in which a large number of livestock die) of 2010 killed about ten million sheep, goats, camels, cows, yaks, and horses—and because they wish to participate in Mongolia’s rapid economic growth, brought about by the country’s enormous deposits of copper, gold, molybdenum, and other minerals. As these informal settlements are not connected to the city’s piped central heating system, locals heat their gers with wood, raw coal, and sometimes even rubber and plastics. 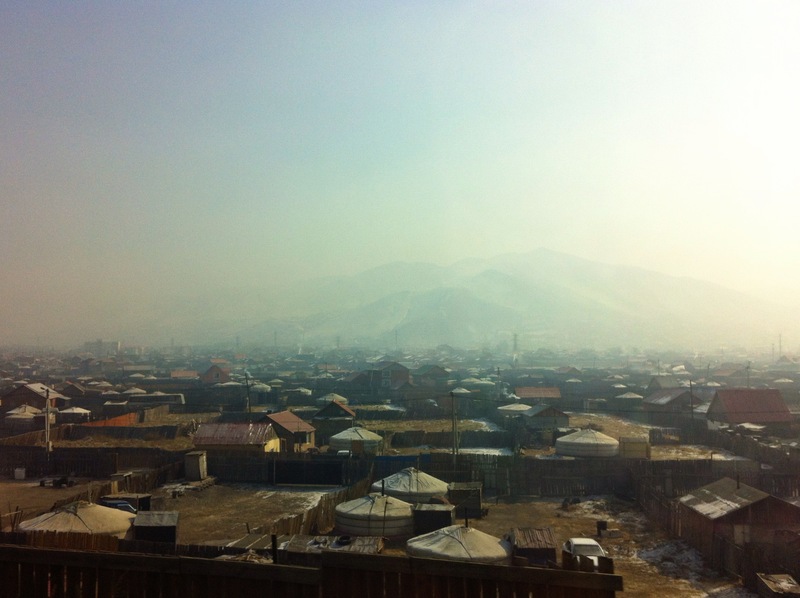 The toxic fumes from these fires are one of the main reasons Ulaanbaatar is among the most polluted cities on Earth, according to the World Health Organization. Looking down at the city streets at night from a bar on the top floor of Ulaanbaatar’s highest building, the aptly named Blue Sky Tower, these problems come to seem like minor growing pains. Mongolia’s population is young, optimistic, and enterprising, and increasingly fed up with the government’s corruption, greed, and disregard for environmental concerns. Hopefully, Mongolia’s resources will not be its curse, and the sky will soon be blue again.